A faint ringing sound in any one of the ears which is a lot like the flutter of wings symbolizes the presence of your Spirit Guides, Angels, Celestial Friends or Midwayers divine beings that exist in higher dimensions) trying to communicate with you. It's nothing really like a sound which can be heard by others around you, but it's more like a short resonating frequency, some kinda signal to your consciousness of an angelic presence or a subtle message from a higher entity. The ringing sound in the ear can also happen with the sudden appearance of a double or triple digit prompt. 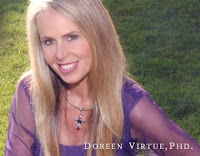 Doreen Virtue speaks in detail about Angelic Numbers and their significance. She says, "The angels do their best to get our attention and to communicate with us. In this way, they help us heal our own lives. However, we often discount the signs they give us, writing them off as mere coincidences or our imagination. The angels say: " We can’t write our messages to you in the sky. You’ve got to pay attention and believe when you see any patterns forming in your life — especially in response to any questions or prayers you’ve posed. When you hear the same song repeatedly or see the same number sequence, who do you think is behind this? Your angels, of course ! " Some folks also notice lights going out or on when they pass by, such as street lights. They may also hear the door bell ring, yet there is no one in sight. It's all due to our fun loving midway friends. They will use almost any electrically controlled device to get your attention. Check out these videos on Tinnitus or Ringing Sound in the ears ... from a spiritual perspective. So true and the gift to have this interaction is trully amazing! Check out my photo galleries of these Beings. Can anyone tell me what seeing the numbers 438 mean? There has been a pattern of myself seeing those numbers..either by looking at the clock, license plate numbers, etc. I recommend Tinnitus Miracle when you experiencing ringing on your ear maybe this is symptoms of having tinnitus is easy to understand and easy to follow. Numbers have specific meanings. Read each digit individually, and try not to comprehend what they might mean to you (I did this once and almost found myself going loopy XD). Don't fret, for the answer will come to you eventually. My hearing in my right ear goes out then theres a ringing in my head that travels from my right ear to my left. Doesnt really have a consistent time frame at how long it lasts. I would like to why this is. Last two years I would always have ringing in my right ear a love interest would contact me and my left ear ringing would be a close family members in trouble....but since I do believe I have connected with my twin soul .my left ear rings high pitch and someone who wants to give calls me....I have just discovered the 1111 I have seen all the time for over a year are Angel numbers Divine source. Am I ascending? When I met my twin soul my heart was signing literly loud hum by just holding hands...? Anyone else hear their heart signing ? Or specific pitches in either ear....i liked when it was right or left knowing that it meant something now its changed. I have been working with these tones for several years now, and have found that there is not much information to be found on the subject. Usually i hear them best while meditating (altough i hear them throughout the day as well). Usually i will hear them in one ear or the other and they are different most of the times. Some are very high pitched, but also sometimes they can be quite low in pitch. I found that when i was solving problems and contemplating different aspects of life and when i understood it i would get very happy and i would hear the ringing in my right ear. And when i got mad about something i would hear a sharp low sound in my left ear. There therefore i feel that at least for me, ringing heard in the left ear represents my lower energy nature and or somebody connecting to me (thinking about me, or talking about me) and is mostly neutral, and sometimes negative in nature. While hearing tones in the right ear represents receiving love, or establishing a really positive connection with ( this has happened many times while talking to people about spiritual matters or other things that we are really passionate about and or in agreement upon.) somebody. Also hearing these tones have helped me to have amazing mystical experiences. The technique i have created for my self involves sinking up my two brain halves trough the tones i hear. Close you eyes, totally relax. Sit in a comfortable position and stop the constant mind chatter. Now focus on the tone you hear, ones you are not distracted by other thoughts take the tone you hear and project it to the other ear also (hearing the tone in both ears. When you hear this tone in both ears and focus upon them. Your hemispheres will be in sync, as they are vibrating at equal pitch, at this point you will probably hear a new and higher tone, or the tone you were hearing will increase in frequency. Keep doing this, and if you do not get distracted and keep your attention on these vibrations. you may start to see geometric shapes, rapid pictures or yet even more amazing things. Do not get carried away, do not analyze, just be with it. Also you may start to feel vibrations in body parts or throughout your entire body. If this happens relax you muscles which you might be contracting without noticing it. Let these high vibrations pass trough your body effortlessly and see where they take you! and on a side note. Ringing in the ears is not just Tinnitus! I can say this from personal experience having had such great experiences using them. for more information about sound and vibrations and how they may affect you, also check out "Cymatics" It has been helpful to me.